Displaying sharp contrast with his predecessor, CJI Dattu has indicated his willingness to accept the Government’s proposal to be appointed as the Chairperson of the National Human Rights Commission (NHRC). “If I get it (NHRC chairperson’s post), it is fine. If I don’t get it, it is still fine. At present I don’t know who will be appointed. Sab prabhu ki kripa se hota hai (everything happens with God’s willingness). Let us see what happens,” he said. While there is no bar against a former Judge taking up a job right after retirement, the trend raises significant questions that strike at the heart of the independence of the judiciary. During his tenure, CJI R.M. Lodha had mooted a radical suggestion to shield Judges from getting influenced by the lure of post retirement jobs. He had requested the then Prime Minister, Manmohan Singh, to bring in a system under which three months before they actually retired, Supreme Court and high court judges would be given the option to either get full salary (minus other benefits) for 10 more years after their retirement or get pension as fixed under the law. Only those who opt for full salary would be empanelled for selection for posts that require retired Supreme Court or high court judges. However, such judges who opt for full salary would not be allowed to take up any private work, including arbitration. “That little salary burden the country may carry for 10 years. It’s a small price the country pays to get an honest, independent justice system,” he said. He had mooted the proposal to two Prime Ministers and hoped that the required modifications in the laws would be considered and brought in. He had suggested that panels of willing Judges be made at both the State and Central levels. For the State level posts, the Chief Minister could consult the High Court Chief Justice, while for the Centre, the Chief Justice of India would provide the names to be picked for a particular job. Justice Lodha has since turned down all offers to head Commissions and Tribunals, saying that he would wait for two years before taking up a job. However, former Chief Justice of India, P. Sathasivam, had rejected the idea of a cooling off period. “As judges we are getting salaries, perks and everything from the government. Do you mean to say we are showing favors as judges of the SC or HCs. You should not have such apprehensions,” he had stated. 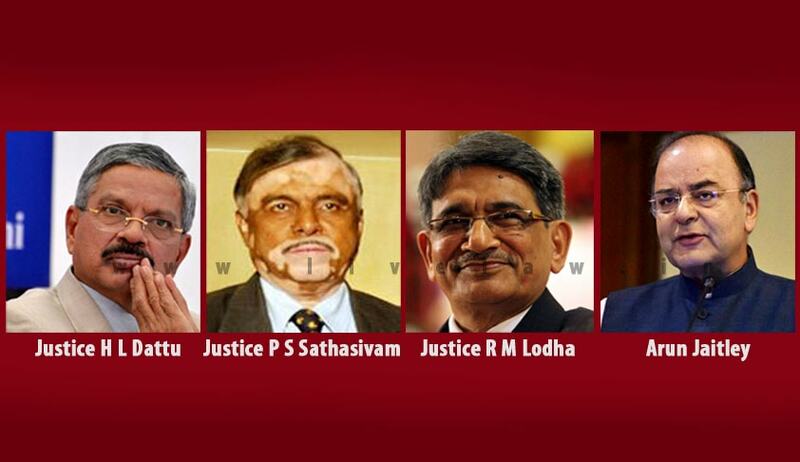 With the Judiciary divided over the issue, the ruling NDA’s U-turn has added fuel to the fire. In his capacity as the Leader of Opposition in Rajya Sabha in 2012, Mr. Arun Jaitley had advocated for a cooling off period for Judges, saying that “pre-retirement judgments are influenced by a desire for a post-retirement job”. “Even though there is a retirement age... But the judges are unwilling to retire,” he said at a conference. He had spoken in favor of bringing in judicial reforms in this regard, batting for the National Judicial Appointments Commission. According to him, this was to be done to realize the dream of having an independent, impartial and fair judiciary in the country. He added that it was important that the judiciary distance itself from the electoral circumstances of the day. “The tendency of judges to follow the ballot box, to get carried with the times, has to be avoided. The judiciary is the lifeline of a democracy, and if people lose faith in it, they lose faith in democracy itself,” Mr. Jaitley said. “In that time (during the Emergency), this fault was seen within the judiciary. We must not make this mistake in today's time, and this is not a subject related to a particular party,” Mr. Jaitley said, as was backed by his party president Nitin Gadkari. He adhered to this stance and reiterated the same in February, 2013, when he questioned Justice Katju's criticism of the then Gujarat Chief Minister, Narendra Modi. In an article published in OutlookIndia titled, Quit or Be Sacked, he had written, “I have held a strong view that Judges of the Supreme Court and the High Courts must not be eligible for jobs in the government after retirement. In some cases the pre-retirement judicial conduct of a judge is influenced by the desire to get a post retirement assignment. However, we are still operating under a system where various tribunals and other quasi-judicial assignments are filled up with retired judges. However, appointment of Justice Sathasivam as the Governor of Kerala and the proposed appointment of CJI Dattu as the NHRC Chairman has reinforced the common perception of parties changing their stance once they are elected to power. Alternatively, he had recommended that the Constitution can be amended to make all tribunals/bodies as an adjunct of the Supreme Court/High Court to enable sitting judges to take up matters assigned to them. He had also advocated for the increase of the retirement age of Judges from 65 to 70. While Former Attorney General Soli Sorabjee had favored a cooling off period, former Delhi High Court Chief Justice A.P. Shah had called for a complete ban on post-retirement jobs. This is a pressing issue to be considered by those presiding in the Parliament, taking into account the suggestions given by the stakeholders, setting aside any political bias and strategy. With Judges being considered equivalent to gods, presiding over as the sentinels of justice, any scope of disputing their propriety would have catastrophic implications on the trust that the common man places on the Judiciary. While there can be no clear attestation of verdicts being influenced by such enticements, it needs to be borne in mine that justice should not only be done but seen to be done.